What they are doing is putting the finishing touches on the replacement of about ten poles damaged in the November 5, 2007 storm that also destroyed a warehouse on the EPB campus. 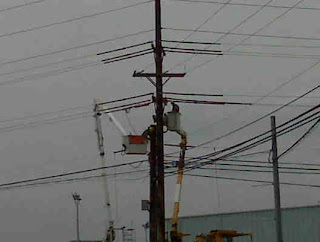 This crew from Pike Electric has been working in Glasgow for nearly a year. Half of that time has been spent repairing the main transmission circuit carrying electric power to the city of Glasgow. This particular pole is at the corner of South Green Street and L. Rogers Wells Boulevard and it carries a 69,000 volt transmission circuit as well as two 12,470 volt distribution circuits. It has taken us nearly six months to repair all of the damage done to these facilities in about thirty seconds on the afternoon of November 5. These repairs have been time and money consuming, not to mention, quite dangerous. Of course, the 69,000 volt portion of the work cannot be performed while the line is energized, so we have been looking for mild weather when the city's electric power needs could be met by using other sections of the transmission grid. That is part of the reason for the long period of time to affect the repairs. That is also the reason why we are rushing to get this section of line repaired because hot weather could arrive at any time. When it is hot, this section of line must be in service or the city's energy needs will not be met. Another big project has been repairing the damage done, by the same storm, to our substation structure at Cleveland Avenue and L. Rogers Wells Boulevard. This steel structure was heavily damaged and torn loose from its foundation. If you look closely as you drive by, the tall lattice structure is still leaning a bit to the south. While it is now firmly reattached to the concrete foundation (thanks to some innovative design work by our friends at American Engineers), the steel was actually bent during the storm and the structure is not perfectly plumb as it should be. So, at some future date we still have to figure out how to replace it. With a few more days of nice mild weather, Pike Electric and the Glasgow EPB team will get all of this portion of the electric grid put back together just in time for the hot weather to come and the additional spring storms that will try to tear it all down again! Such is our battle with nature. At the same time we are also just putting our R.R.Donnelley Substation back together after the intense fire damaged the main transformer in that facility back at the end of last summer. Within a week or two, that piece of vital infrastructure will also be back in service for our community. When that happens it will be the first time in almost a year that Glasgow's electric grid will be back up to full capacity. Speaking on behalf of the Glasgow EPB team, we hope it stays that way for a long, long, time.